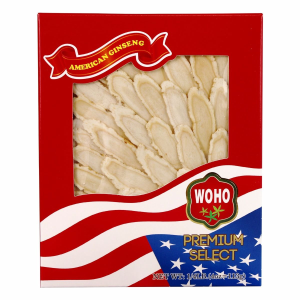 DailyVita 15th Anniversary sale: WOHO American Ginseng, sea cucumber buy 3 get 1 free. Every customer gets Carlson fish oil 30 softgels for free automatically. Buy any product get free shipping. DailyVita.com is the ultimate online retailer for nutritional supplements, fitness supplements, natural beauty products, and gifts such as ginseng and sea cucumber. Here you will find the highest quality products with the lowest prices online. Recommended：American ginseng (Panax Quinquefolius) has emerged as one of the most popular health supporting herbs. It has been traditionally used to negate the effects of fatigue and stress. It’s often used as a general health tonic to enhance a person’s mental and physical performance. Throughout the world, American ginseng root is highly prized and sought after for its medicinal and stress relieving qualities. Economy bundle. Save money. Perfect for family or self use. Roots & slices all in one. Convenient for multi-purpose use. Resealable container, for easy storage. Add it to tea or meal, Bring energy to your daily life. Bird’s Nest contains proteins, amino acids and minerals that are essential for healthy development. Regular consumption of Bird’s Nest helps prevent colds and flus, which is good for pregnant women. By improving the function of the Lungs and Kidneys, Bird’s Nest helps boost the body’s immune system. Use the coupon code：BN100 to save $100 for your birds nest order. $0 Ginseng fibers for all orders$100+ April Special Sale: Select products up to Buy 1 Get 1 Free Ginseng fibers or Ginseng Mini Slices for all orders over $100!